Take That are a band that originated in Manchester, England in 1990. The original members were Gary Barlow, Mark Owen, Robbie Williams, Jason Orange and Howard Donald. Between the band's first single release, "Do What U Like" and "Promises" in 1991 and their cataclysmic breakup in 1996 when Robbie Williams left the band to pursue a solo career in 1995, the BBC described Take That as "the most successful British band since The Beatles, beloved of young and old alike." Take That's dance-pop tunes and soulful ballads dominated the British charts in the first half of the 1990s. They released two of the best selling albums of the decade with Everything Changes (1993) and Take That: Greatest Hits (1996). According to the AMG Music Guides, "at this time [they] were giant superstars in Europe with the main question about them not being about whether they could get a hit single, but how many and which would make it to number one." The band reformed with the exception of Robbie Williams in 2006 and released their first new single in 10 years: "Patience." Following the success of "Patience," they released the album Beautiful World which topped sales in 2006 and sold more than the current release by Robbie! 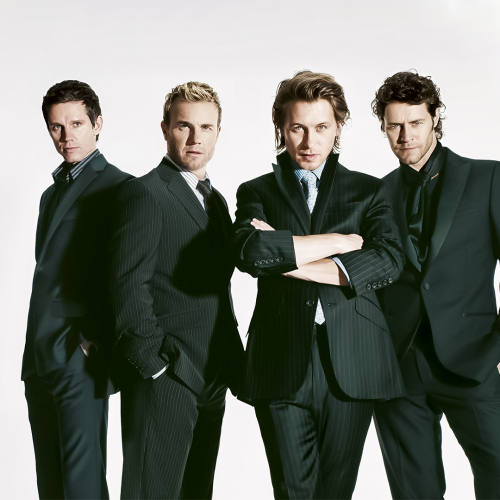 During 2007, Take That also wrote a song for the motion picture Stardust titled "Rule the World" which reached #2 in the UK charts and went on to be the 5th biggest selling single of 2007. Meanwhile the album Beautiful World was the fourth biggest selling album of 2007. The 2008 Brit Awards provided Take That with a Brit for "Best Live Act" for their "Beautiful World" European tour and "Best British Single of The Year" For "Shine." In late 2008, the group released their second album since their reunion entitled The Circus which made it to the Christmas number one spot in 2008. In July 2010, it was confirmed that Robbie Williams had rejoined the band, and that they would be releasing new material together in late 2010. The first album to include Robbie Williams was released on November 15, 2010 with the title Progress. This album gained very good to excellent reviews in publications as diverse as The Telegraph and Q (which gave it 8/10). Q said, "Progress is a triumph; musically, conceptually, [and] personally." It was announced in September 2014 that Jason Orange had left the band as he did not "wish to commit to recording and promoting a new album."